This video guides you through the setup&activation. Enjoy! The first step is to reach out and request an invite code. loots has a rapidly expanding community and we’re always bringing in new streamers and sponsors! Be sure to check that your email spam filter isn’t blocking loots, you don’t want to miss out! Once you have your invite code, go ahead and log in. After you’re logged into loots, go to the Invite Code Redemption page and punch in your invite code. Now go ahead and click the Run Setup button. The first step in this process is to select the platform you will be using loots on and confirm the accounts are linked. Currently, loots supports Twitch, YouTube, Mixer (formerly Beam) and Smashcast (formerly Hitbox). If you stream to multiple services, select one of them for now (you can add the others after). Upon selecting a service, you’ll be brought to a page where you will link up your accounts and activate loots. After you’ve confirmed your account link, you’ll move onto the next step. This is the website your viewers will visit to send you Sponsored Tips! Type your name in and hit that Next button. Now that you have your account set up, let’s enable the on-screen notifications! Currently loots supports multiple streaming programs such as OBS, Xsplit and GameShow! Open your preferred broadcast software and create a new browser source. Insert your custom loots URL displayed on the loots setup page. Common mistake: 800 x 600 are the default settings. To have loots in the right size, the resolution needs to be the same like your stream. Press “ok” and you are ready to rock. Right click on the loots URL. 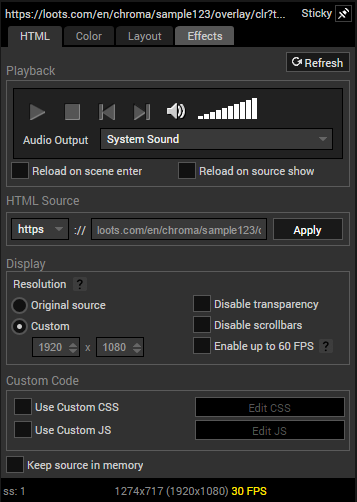 Under “resolution click on custom and select the width and height to your streaming resolution, for example 1080 (1920 x 1080), 720 (1280 x 720). To have loots in the right size, the resolution needs to be the same like your stream. 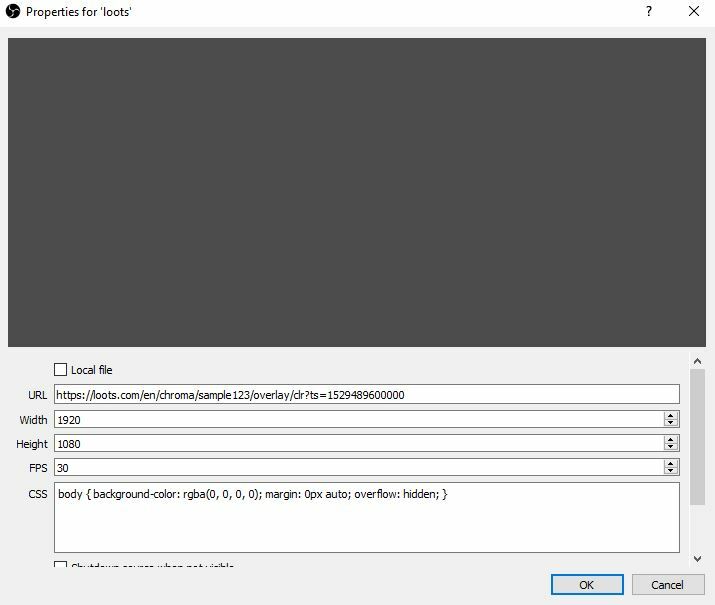 For broadcast programs other than OBS, you will likely need the custom CSS string displayed below as well. This ensures the formatting is correct when your messages are displayed. Save your source and add it to whichever scenes you’d like to enable loots in. Ensure the source is on top of everything and isn’t blocked or obscured, this way your viewers can clearly read the messages when they pop up! That’s it! You’re all set up and ready to start earning loots! 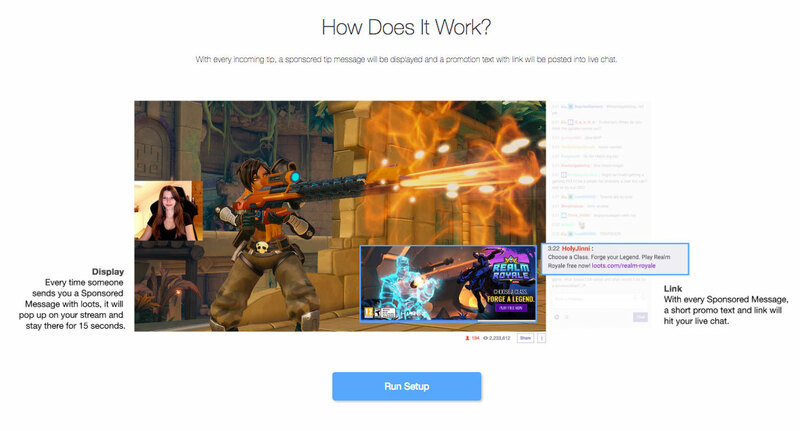 When you start your stream, you’ll see your loots messages display on your Live page. 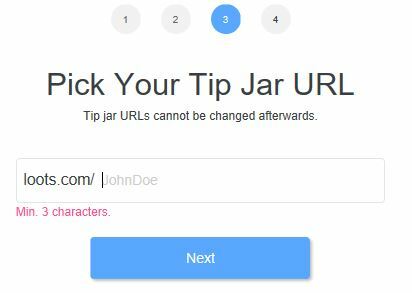 You can also test your setup by sending yourself a message via your Tip Jar URL. Only you can send messages while you’re offline. To send you your monthly loots payout, you will provide the information we’ll need. We use PayPal to deliver payments to our streamers. 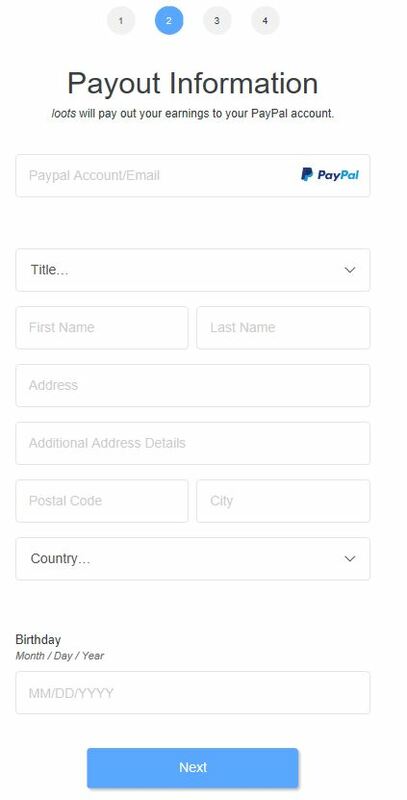 If you don’t have a Paypal account, you can create one for free at paypal.com. For more details on how our payouts work, feel free to read about the process here.